For me, it started like this: ‘I want to drive my car less and bike more.’ Simple. 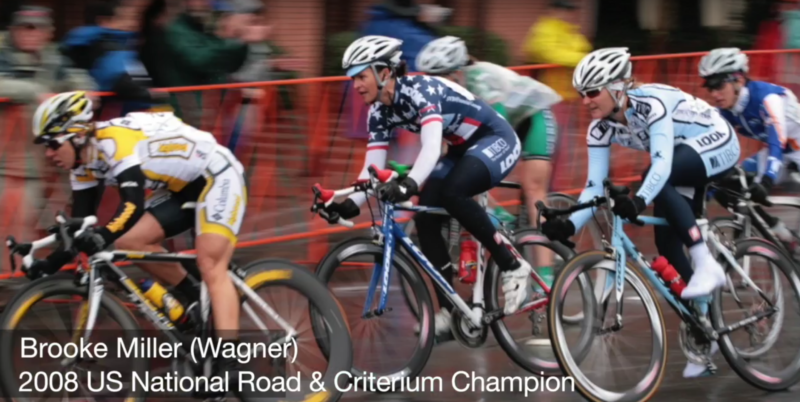 I’m a former professional cyclist. I love riding bikes. I’m pretty darn good at it. It should be easy. But in truth, it was not quite so simple. Do I have the time? Can I afford to be a sweaty mess when I get where I’m going? I have four-year-old twins. How can I bring them along? Do I have the energy to ride a bike when I am always exhausted, because I am a mother of the aforementioned young’uns? Is it safe with my children? Getting an Xtracycle Edgerunner electric cargo bike has changed my life, because it allows me to do what I have always loved: ride my bike. It doesn’t matter what I have to carry. It doesn’t matter what the hills look like. It doesn’t matter if I wear a dress or nice clothes. It doesn’t matter if I don’t have the energy to spare. This bike is the perfect fit for me and my family. Now that I have one, I see it all so differently. It is an amazing tool that is allowing my whole family to break free of the car. The truth is that I won’t outgrow this bike. This is my new car, one that happens to be a minivan and pickup truck rolled into one. I still love my other bikes, but this is the one that has changed my life the most profoundly. If you are reading this, I am guessing you are probably trying to decide if an electric cargo bike would work for your family, but you’re wincing at the price tag (I winced a LOT, too…). I reasoned that if I would actually ride it and love it, I would get over the spendy cost. But before I wrote my check, I did a lot of research and asked a lot of questions to make sure that it would be a good fit for me and my family. Do I have my kids with me? Would I feel safe riding with them (on this route and with that bike)? What do I need to bring there and back? Will I be a sweaty mess? How am I going to store and transport the bike? Can I stomach the big price tag? This is one of the biggest factors that people ask with respect to electric bikes and one of my first questions. The Edgerunner uses the Bosch mid-drive system and has four different assist levels. What that means is that depending on how much assist you opt to use, your range varies. I have found that I typically range 18-20 miles on full turbo mode but if I am worried about range, I can dial back the assist to get 40-50 miles. Realistically, I typically don’t do more than 20 miles in one trip, so I usually opt for full turbo. Why? Because it is fun (uh, really fun). The Department of Transportation conducted surveys that found that the average single trip distance by car was only 5.95 miles in 2009, meaning that the average trip could be easily made by electric bike. This seemed crazy to me at first until I started looking at my own driving patterns and how those individual trips look. I don’t think that most of us really realize just how much we use our car for short trips that could easily be done by bike, particularly if it is an electric cargo bike. For me, I realized that as long as the trip was within 5 to 6 miles, I would absolutely be doing it by bike if I could handle the load and time. I used a website to draw a map with a 6 mile radius and looked to see the majority of my errands, which I typically made by car: Kid’s school, grocery stores, pet stores, Costco, hardware store, shopping centers, parks, downtown, friend’s houses, pool, lake etc. I was conservative in this estimate because the radius shows “as the crow flies” when actual routes are a bit longer. This radius showed me that easily 90%+ of my travel could be done on bike. I was actually surprised by just how close most things are that sometimes feel like they are so far away. Typical bike commuting or running errands on bikes takes extra time; having an electric assist changes that dynamic drastically. After riding my Edgerunner for over 500 miles, I have averaged 14-15 MPH in my neighborhood with all the starts, stops, and steep hills. Driving a car is not typically much faster because red lights and stop signs are usually what limit your speed. A car averages about 18 MPH around town; just ask Google. That means that it is roughly a 20-30% difference in speed. That sounds like a lot, but that means that a ten minute drive only takes an extra 2-3 minutes. When you factor in not having to find parking or deal with traffic, that usually becomes a wash. Longer trips will obviously vary more in time between bike and car, but in reality, with the range in which you opt to ride the bike, the difference is typically minimal. Even on my longest rides, time often becomes a non-issue because of the benefit of avoiding traffic and parking challenges. In practice, I allot myself an extra 5 minutes for most of my longer trips, sometimes 10 if I am going quite far. As a society, it seems we are always in such a hurry. But with my bike, I have found that slowing down 5-10 minutes is a very welcome and positive change in my life. With the mental and physical health savings of not being in a car, I feel like I will make it up in a longer, happier life anyway! Being a stay-at-home mother, the biggest barrier to riding my bike has been having to bring my children with me. We have the Junior Co-Pilot Passenger System on our EdgeRunner, so my twin four-year-olds can always ride on the back along with me. Prior to the EdgeRunner, I had tried everything from kid trailers and tag-along bikes to bike seats. Even with my high bike motivation, nothing worked well for replacing my car. Biking with the kids was more in the category of “workout” or “adventure with kids” than everyday experience. 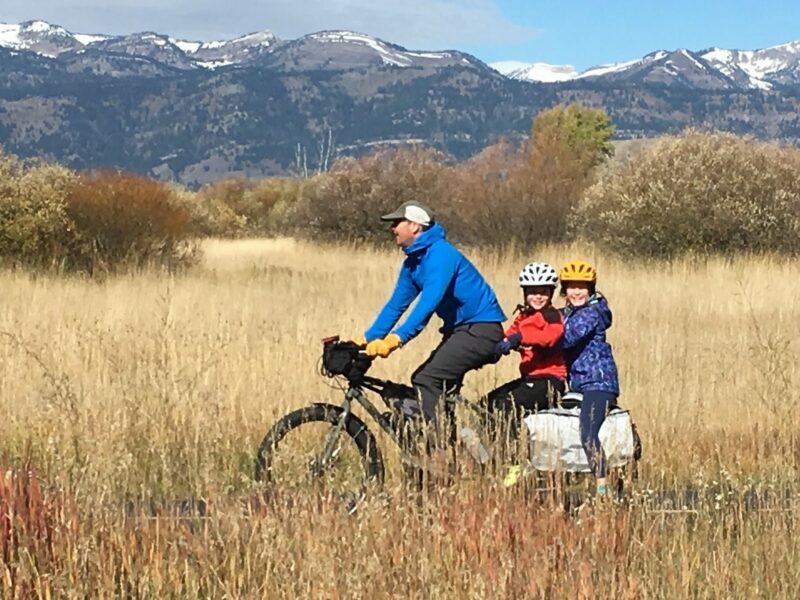 I asked myself, if I could ride with my kids as easily as I could ride by myself, would I? The answer for me is clearly yes. With an electric motor on a cargo bike, I have found that biking with children is as easy as biking without. 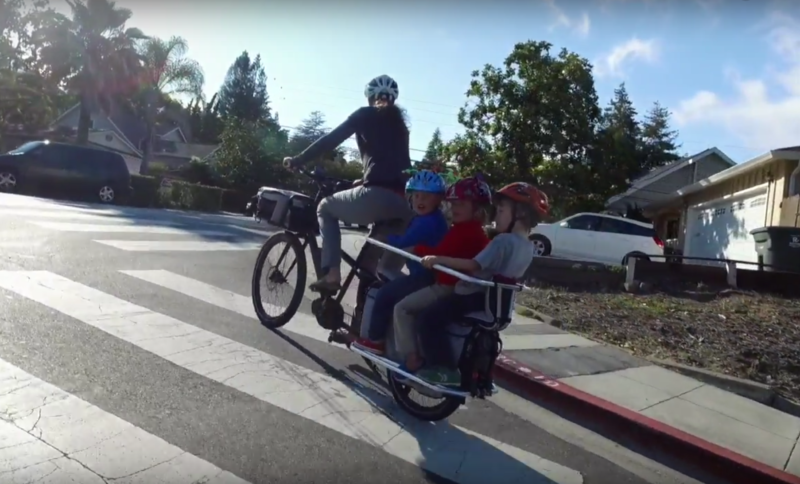 These days, I routinely “drive carpool” with the Xtracycle and bring three kids (easily 130 lbs of children) up a very big hill. It is important that your cargo bike has great balance and a motor with high torque like the Bosch CX in order to handle hills with heavy loads. Balance on a bike is not just a product of how you load it. It is also about how the bike is built. A smaller rear wheel means that the heavy loads on the back have a lower center of gravity and make the bike more balanced. It makes a huge difference. But the geometry and materials of the bike itself create balance. A well balanced bike is easy to ride at very slow speeds with a heavy load, without you having to bounce your foot on the ground and physically hold the bike upright. If a bike is well designed, as mine is, a heavy load doesn’t affect the way the bike rides. I can take my hand off the bar to signal or scratch my nose, and turn my head without the bike lurching. I don’t feel like I am hauling a heavy load because the bike is engineered to be comfortable to ride with heavy loads; those bigger tires are perfect and create a built-in suspension system that works with the reflexive chromoly-steel frame. I find this especially important when I am hauling the most precious cargo: my children. 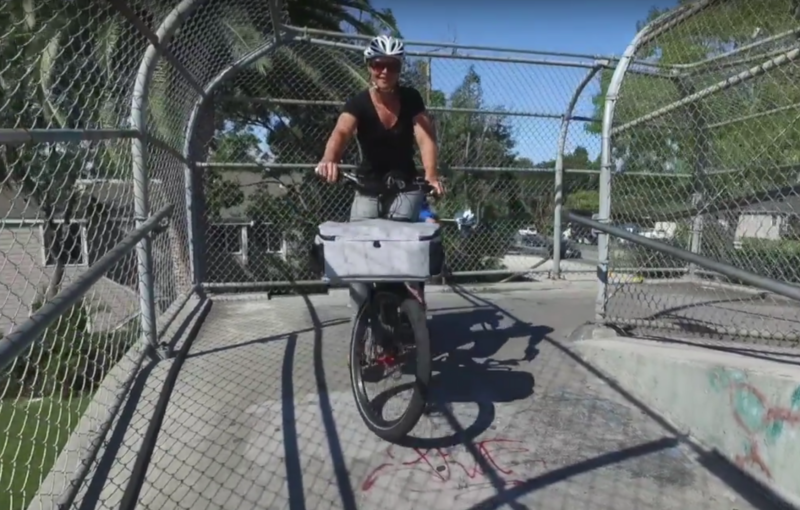 When I tested cargo bikes, balance was extremely important to me: did the heavily loaded bike handle slow speeds, maneuver easily, handle broken and bad pavement well, ride stably so that I could pilot comfortably without fighting the bike? Did the bike feel stable and safe at high speeds? Did the motor lurch or ride smoothly? How well did it handle steep hills? For me, these questions could not be addressed without trying the bikes loaded. I was fortunate enough to be able to try out several electric cargo bikes before finding the one that passed all the tests that I put it through and was the perfect fit for our family. WILL I FEEL SAFE RIDING WITH THEM? Obviously, as a mother, safety of my children is paramount. Cycling does expose us to risk, and as a former professional, I have crashed my bike far more than most people. When deciding if this bike would replace my car for my specific errands, I had to consider which routes I could take and feel safe with my children on back. People often do not realize that the best routes for bikes are not the same as the best routes for cars. When deciding if an electric cargo bike was the right fit for our family, I had to think about routes and safety. I recommend for anyone thinking about making this transition to take some time to look at GoogleMaps and try out “Google Bike” directions for suggestions on the best routes. For every location that you are likely to travel to frequently, find the best route and try it out with a bike. See if it is one that you enjoy riding. See if it is one where you feel safe with respect to traffic. For me, finding more residential routes is the first step in feeling safer on a bike, but of course helmets are a must. In terms of feeling safe with the kids on the back of my Edgerunner, I was actually blown away with how much safer it felt than any other previously tried method of riding. The Hooptie is sort of a half roll cage for the kids with two railings on the side so that the children’s hands are protected if I were to scrape against a bush or wall. Because the bike is so well-balanced (yes, I harp on the whole balance thing because it is SO important! ), it doesn’t feel wobbly or unsafe to have them there. I have ridden with child seats on the back of other bikes and the feeling is quite different. I tested this bike and I DO feel safe with the children. Especially when I am smart about the routes that I pick. One thing about having the electric assist that I didn’t anticipate is how much safer it makes the bike for riding with children. All other means of riding with children mean riding slowly and starting out slowly. Although this is fine when riding on quiet, flat residential streets, there are times when I would feel vulnerable at an intersection because I crossed so slowly. With the electric assist, the bike starts fast out of an intersection so I can cross quickly before cars begin to approach. Because I can easily ride 20 MPH on the bike, I often ride the speed of traffic. This means fewer cars pass me and I can often “take the lane” so no cars pass me when I am in slower traffic areas. This has actually opened up a number of roads to me that I would not have ridden without the assist—for example, the road to the children’s school is a twisty road that goes uphill. Cars cannot drive it fast but there isn’t room for passing a bike safely (especially a bike with a trailer). Because of the electric assist, I can go the speed of traffic and not get passed or hold cars up. I would never have ridden up that road before; it would have been too dangerous on a slower bike without assist. Now it is a pleasure. One of the other considerations for an electric cargo bike purchase is the quality of the brakes. Electric assists are expensive and often e-bike manufacturers put lower quality parts on the bike to keep the cost down. DO NOT SKIMP ON BRAKES! Living in a hilly area and carrying heavy loads has made me fully appreciate the high-quality hydraulic disc brakes that I have on my bike. Safety is paramount and a fully loaded cargo bike takes a lot more force to stop (particularly on a downhill) than a traditional bike. Brakes are something that people who are interested in family cargo bikes should pay very close attention to. I know that I have full control of my bike, even on those fast descents with three kids on the days when it is my turn to drive carpool. Cargo bikes, by nature, are designed to haul loads, but some do it better than others. In the search for the perfect e-cargo bike, I looked at a lot of different bikes that all should in principle be able to haul the same types of loads, but some fell flat. 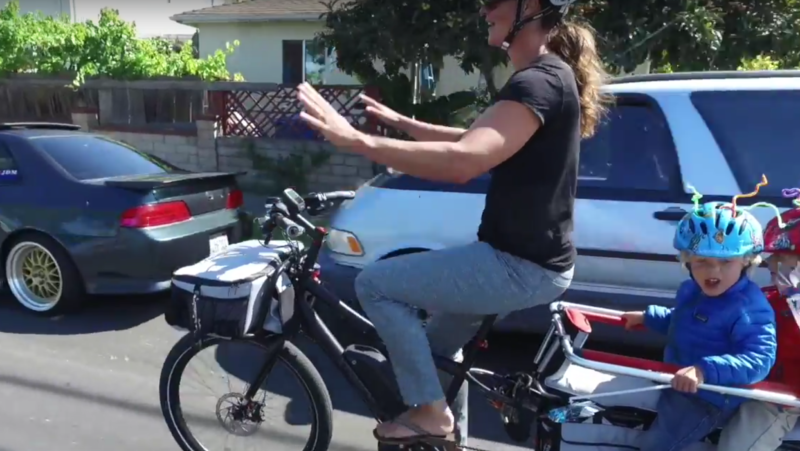 As I have emphasized previously, balance is critical in terms of how the bike handles the load, but the way the bike is designed to natively carry loads also played a huge role in my decision on making my e-cargo bike purchase. 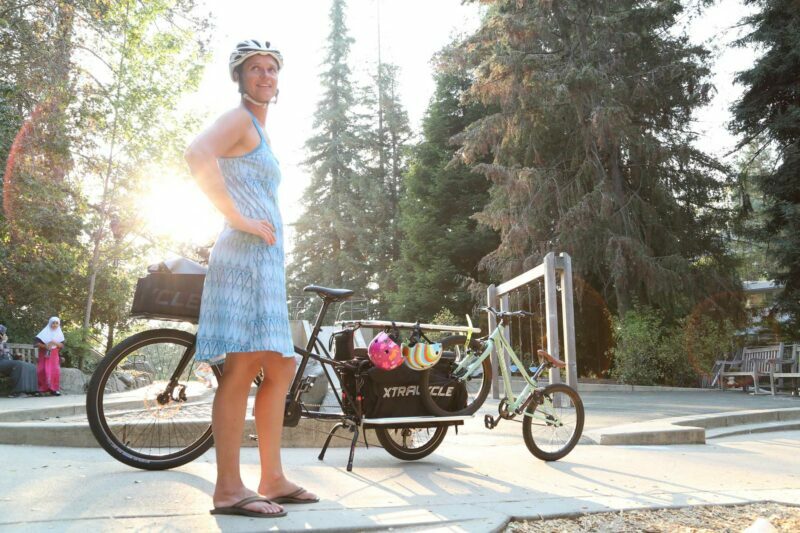 To get the most out of a cargo bike, you should always have bags: panniers that go on the back and, in my experience, a rack and pack system on the front. The beauty of my cargo bike is in how well it is designed to haul stuff without having to jury-rig the setup. My Edgerunner won me over with phenomenally well-designed bags that allow me to haul just about anything. It wasn’t until I started testing various cargo bikes that I realized how limited many of the bag designs are on most of the bikes out there. The Edgerunner starts with what I consider a bare necessity: two big bags in the back that have a waterproof cover. When I am not using them, they fold flat against the rack and are not really noticeable, so they are always there for when I need them. I can open those bags and put in two fully loaded grocery bags in either side and cinch it down to keep the load secure. I can choose to place the covers over the top or remove them if I have something that goes in the bag that is taller and bulkier. If I have the kids, they straddle the bags. If I had younger children and they were in Yepp seats, I would leave the covers off so that the seat legs would rest inside the bag and the groceries would go in alongside. It is important that the kids can ride along with the bags and cargo, or you are limited. When hauling bulky, hard-to-carry items, the Edgerunner pannier has a special “sling” that is truly genius. If I am heading to Costco with the kids, I don’t want to miss out on a Costco icon: toilet paper by the pallet. If I intend to carry something that doesn’t fit inside the pannier, the flap on the side of the pannier opens up and I use the built in straps and buckles to cinch my load down securely. If it is super bulky, the kids will sit side-saddle but usually they just rest their legs on top. I have loaded my bike with multiple cases of beer, bulk boxes of diapers, a pallet of toilet paper, and a big tower floor fan—all with the kids riding on back. Having single large bags on the side vs. multiple panniers on each side, as some other bikes have, is a huge advantage. I don’t have a dog, but I have chickens, and chicken feed comes in 35-40 lb bags. 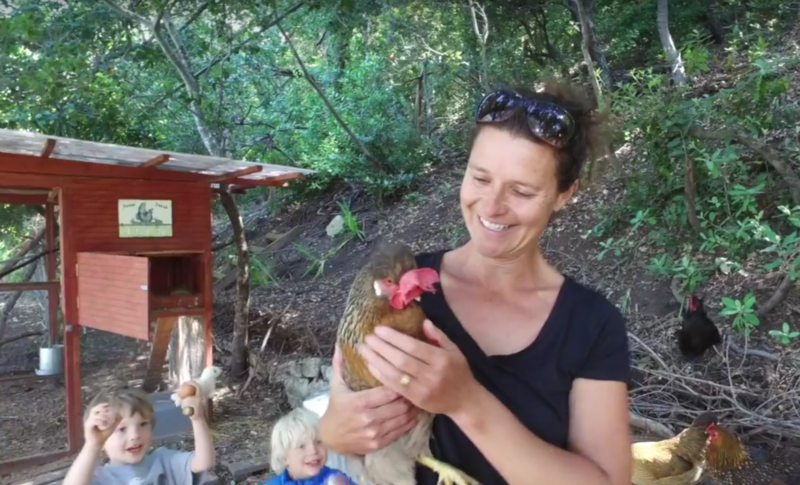 Having such big panniers allows me to put a bag of chicken food in each side so that I can easily haul 70 lbs of chicken feed as well as my two children. For people with dogs, I can imagine that hauling a 40 lb bag of dog food back from the pet store on bike seems daunting. In this case, it is not. And because the bike is (yes, yes) so well balanced, carrying one bag on one side is still not a problem. I don’t have to buy two bags of chicken food… it is just that I always do and there is no reason not to just because I am riding my bike. Another aspect of cargo bikes that I didn’t fully appreciate before doing some very lengthy test rides are the wonders of the front rack. A good front rack attaches directly to the frame, and not to the handlebars or fork as most baskets or front panniers do. When weight is attached to the fork or handlebars, it drastically affects the way the bike rides as the weight throws the handlebars around and makes the bike unstable. Having the weight on the frame eliminates this problem, and it is simple to carry even very heavy loads up front, where things are easily accessible without affecting the handling of the bike. The Edgerunner has a PorterPack option that I have come to really appreciate. They have one feature that is really fantastic that I have never seen on another bike: a cinch bag. When riding with a bunch of bulky items, I open the PorterPack and load them inside. The cinch bag is essentially a bag that comes up on the sides and cinches down on the top to keep things secure. I often ride with my purse, jackets and groceries in the front PorterPack and I don’t have to worry about them falling out because I use the cinch bag to hold them down. I almost left off the PorterPack and was planning on putting on some sort of cute basket, but I am very very glad I didn’t. Open baskets look quite nice on a bike but after having my cell phone driven over after it bounced out of one such basket, I am no longer a fan. The expandable cinch bag on the PorterPack really doubles the storage so that it is deceptively large. I recently used it to carry two gallons of milk, 6 jars of jam, a few bunches of bananas, my purse, a change of clothes for my kids (forgot to take it out), and a quart of buttermilk. That was just in the front bag. When attempting to figure out which errands you would be able to do on this bike, figure that the bike can easily handle a full shopping cart (6 bags or so of groceries) and many bulky items. I have also carried lumber (six 1”x”5”x6’ boards), bags of soil, plants from the nursery, including 5-gallon pots (a beautiful salvia), two children’s bikes strapped on the side, as well as the aforementioned Costco items, a large tortoise, cupcakes, and watermelons. Before getting this bike, I thought that an electric bike was somehow cheating because it had a motor. Coming from a professional cycling background, I had always associated bikes with fitness, even in the context of bicycle commuting. I felt that the reason to bicycle commute was to get fit, which in my mind involved a lot of sweat. Now that I have ridden this bike so extensively, I realize that the true power of this bike is that it IS easy to ride. I never have to worry about what I am wearing or if I am going to be a stinky, sweaty mess when I get there. I had not appreciated how great this is until I started riding my bike everywhere. Because of the electric assist, I can ride this bike with the equivalent effort of going for a walk. If the hills are very steep and the load very heavy, it’s like a brisk walk. This means that I don’t need different clothes for riding my bike. I often bike in my dresses and use a safety pin clipped between my legs to prevent them from flying up. I don’t typically wear high-fashion clothes, but the way I dress to hop on my bike is different from what I wear to drive in my car—unless, of course, it’s raining. (But I have rain gear for me and for my children, so that doesn’t stop me either.) I am personally not concerned with what my hair looks like after wearing a helmet since I usually have it thrown back into a ponytail anyway, but not sweating under my helmet is kinda nice when I don’t want to feel unattractive at a restaurant or at a dinner party. Something that I also didn’t understand before having children is simply not having enough energy to ride a bike. Now that I am a mother of small children, I understand true fatigue. I no longer have the luxury of feeling that “good kind” of tired from getting in a good workout. Now tired is tired. There is no good or bad tired. It is all bad. 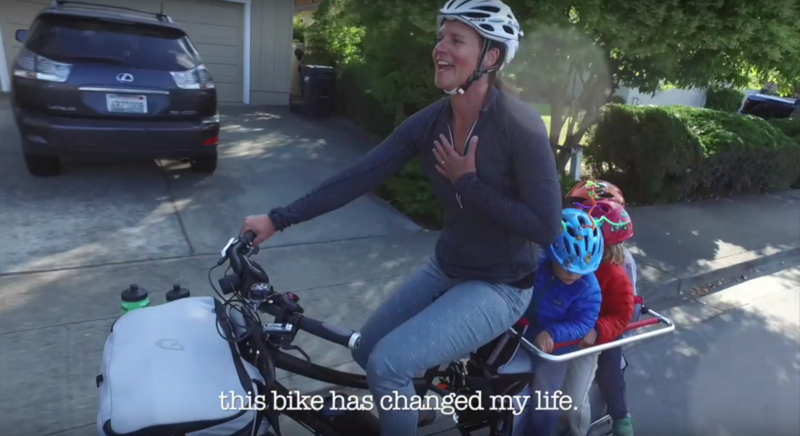 Before I got my Edgerunner, biking with the kids was such a hard effort that I simply got too tired to be the kind of mother that I wanted to be. When I am tired from an effort like that, I am impatient with my children and don’t have the energy to engage with them. With this bike, it is different because I am getting exercise that energizes me because I am moving my body and out in the world, but I am not putting in such an effort that it exhausts me. As a parent of young kids, my energy reserves are so low that without this bike, I really wouldn’t be able to replace my car, because I honestly don’t have the energy to haul a bike trailer and then not scream at my children play with my children later. One of the other important factors in deciding if an electric cargo bike would work for your family is: how are you going to store it? Unlike a 14 lb carbon fiber road bike that is easy to drag around and hang from the ceiling or wall in your garage, an electric bike is heavy. An electric cargo bike is really heavy. And big. Coming from the bike-snob world, how much does it weigh is probably one of the biggest questions that I get. This is because with a traditional bike, weight correlates to how the bike rides. The answer to that question, really, is “a lot, but totally irrelevant.” The weight of the bike doesn’t matter at all when riding, because of the electric assist and the fact that it is designed to haul heavy loads. It’s kind of like asking how much a huge pickup truck weighs. But weight does matter in terms of loading it and storing it. When looking at all the e-cargo bikes out there, some do weigh less than others, but often the weights that are published are without the racks and bags that make it a cargo bike. The differences are negligible since all the bikes are so heavy. Even 10 lbs is meaningless. I opted for the Edgerunner because the chromoly-steel frame feels and rides so much better and the bike is designed to handle such heavy loads. The beefy frame doesn’t bother me: it is what makes the bike feel so safe. The fact that the bike is big and heavy means that it is not as simple to transport and store as a traditional bike, so more thought needs to go into this element. For us, storage is no problem at all since we park in the garage. Because of the kickstand, I can park the bike right next to the outlet where I leave the charger. The PorterPack has a great mesh pocket where I put my garage door opener to make it even easier to come home. Since it’s so well-balanced, I can maneuver into the garage at low speeds with my heavy loads and easily dodge the chaos of tools, camping gear, heaps of laundry and whatever other messes I have left down there. If you don’t have a garage, it might be a challenge to get it in and out of the house and that might become a barrier to you riding. It might be worth getting a super-good, high-quality lock and storing it outside with a tarp. I would not normally store a bike outside, but if you had to carry your bike in and out of a house, it could possibly mean that you are not going to want to ride it. But you can roll an Edgerunner through doorways, stand it up in elevators, and so on. You’d be surprised. Transporting the bike with another vehicle is another challenge due to its weight, but there is a trick: the rack on the back with the family pack and panniers comes off with four screws. This drops a large amount of weight and makes it so much easier to load it on a roof rack. I have a regular fork mount rack on the roof of my car and I just allow the rear wheel to rest on the roof of my car at an angle. I use some velcro straps to hold it down and it works pretty well. I have thought that if I were to have to transport it with any form of regularity, I would just buy a roof rack designed for tandem bikes so that it would be even easier. From a practicality standpoint, however, I find that we don’t transport the bike by car all that much since I am usually riding it from my house. I have taken it on trains and taken it on the roof of my car, and both have worked for me. For anyone who would need to regularly transport the bike, it would be good to look into a rack specific for tandem bikes. This is a biggie and one that I struggled with for a long time. 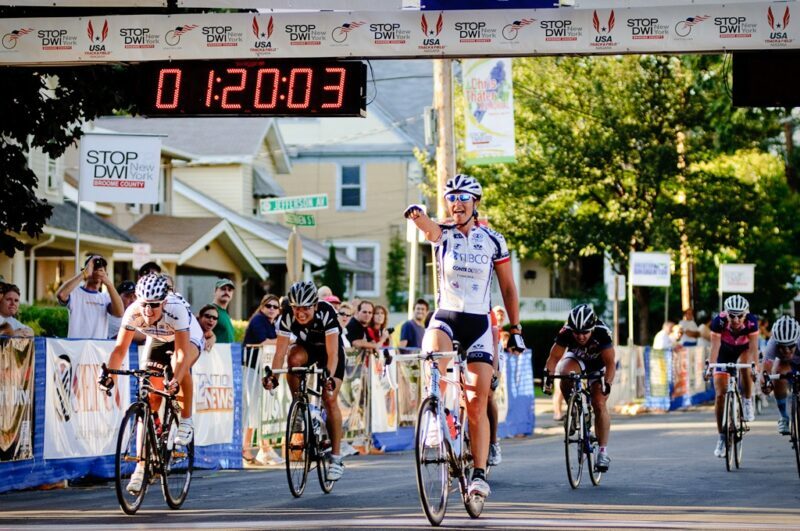 For me, it really came down to this: if I love this bike and I ride this bike, it is worth it. If I don’t ride it? It doesn’t matter even if I got a great deal. Electric bikes are very expensive because quality electric motors are very expensive. If the e-bike is not expensive, I would question where they are cutting costs and ask if it is worth it, especially if it is a bike that I am going to use while riding with my children. Starting at the motor: I opted for the mid-drive Bosch CX first because it does so much better on hills. There’s a plethora of articles talking about how mid-drives are better for hills, and I can tell you after some demos, it is true. In terms of riding with heavy loads, the mid-drive delivers a high level of torque and really performs exceptionally well. When I first started looking, I found that there was no shortage of different makers of electric bike motors but their performance varies tremendously. I chose a bike that has the Bosch motor because it really stood out as being so much smoother than the others that I tried. But, more important, I trusted Bosch. I know that Bosch is making a huge number of electric bikes in Europe and that they are not likely to go out of business. I felt that the biggest problem would be if I bought a bike and the motor had problems (say a few years down the line) and I couldn’t get it serviced because the company had gone under. I know that Bosch is a huge company that makes highly reliable and high-quality products, and I researched to find out that they will continue to make spare parts for 7 years after a product is discontinued. So, even if they stop making e-bike motors (doubtful! ), they will stand behind their product. I knew of no other reassurance in other brands. Plus it also was so smooth. A lot of other e-bike motors will surge forward and lurch the bike. This motor is so smooth that it simply feels like you are riding a bike that is really easy to ride, not a bike that is surging forward and that you are fighting to control. I felt that it had perfect control if I was zipping around at 20 MPH or if I was creeping along at a snail’s pace and weaving between people on a crowded walk. One of the other things that I learned when researching these bikes is that in order to bring the cost down, some companies put on lower-quality bike parts. A big part of wanting to ride a bike is how nicely it rides. There is a mantra: “you get what you pay for.” And with bikes, that is definitely true. Better quality parts perform better. Brakes work smoothly and stop you reliably. Shifters are easy to shift and the gears change smoothly, bearings are smooth and wheels roll freely. Most importantly, parts last longer and are easier to service when they need a tune up. I am particularly sensitive to the quality of bike parts because I am my own bike mechanic. Any mechanic will tell you that cheap parts are horrible to work on because you simply cannot get them to work right. The bike might start out feeling fine, but as you ride it and parts start to wear, it will become more and more noticeable. So for me, the extra money that I spent on my bike to get better quality was a trade that I was very happy to make (after my initial heart attack of just how much I was planning on spending on this bike). The next thing that was important to me in determining which bike I would be spending so much money on was: How did it ride? The geometry of the bike and the material of the frame drastically affect how the bike rides. When I was testing other bikes, I felt that the aluminum bikes were too harsh of a ride; when I rode over bad pavement, the vibrations made the bike feel unstable and very uncomfortable. I found that when I saw bumps coming, I would feel my body wincing at the impact that was coming. Aluminum is a low-cost, lightweight material, which is why they often build bikes out of it, but it is my least favorite bike material. It is stiff and very unforgiving, making the bike bounce at every bump. I also didn’t trust aluminum to hold up to the weight that I would be putting on the bike. Aluminum is notorious for being brittle and snapping easily. I didn’t trust it. Because so many bike makers focus on weight, most of the cargo electric bikes that I looked at were aluminum and I confirmed my judgments about it as a bike material. I really noticed the difference in the lightweight chromoly steel of the Edgerunner. It was a hard pill to swallow that the Edgerunner was so much more expensive than the other bikes I tried, but in the end, it really was in a category of its own. It didn’t lend itself to meaningful comparison to the other bikes I tried. Between the quality of the parts and motor, the way the bike rides, and the way it is so efficiently designed to haul loads that other bikes simply can’t, there really is nothing else like this bike. I confess: I am a total zealot. My only regrets are that I didn’t get this bike years ago—and that we have only one.